Please congratulate the boys’ varsity soccer team on a total team effort last night, in a 3-1 win over McCallum on Senior Night! Playing their last ever home game, the evening started by honoring our Senior players Michael Varela, Juan Castilla, Juancarlos “Cubo” Hernandez, Luis Lopez, Mauricio Ulloa, Dauvin Cardero, Chris Torres, Alex Luna, Juan Alvarez, and Cristian Suarez. 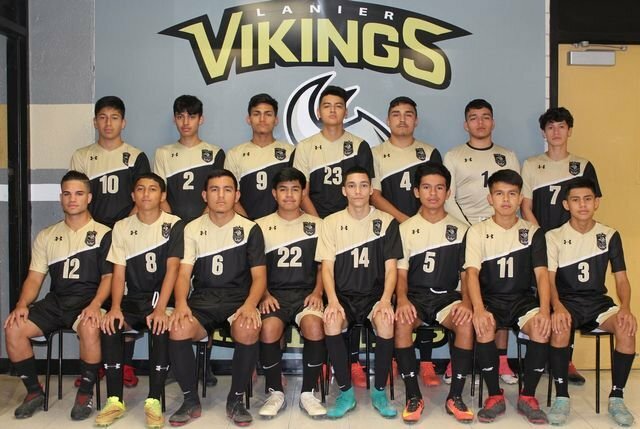 The Vikings started hot when Luis Lopez assisted on an own goal in the opening minutes. In the second half, Luis Lopez, dribbling past several players in a buildup from the midfield, found the back of the net for his second goal (on an assist from Juancarlos Hernandez). Andy Madrid sealed the victory later on with a goal on an assist from Luis Lopez. With our district spot secured and nothing to lose, the Vikings gave it their all, and got valuable contributions from every player on the team. The win against a playoff bound McCallum team is a confidence booster and helps give the team momentum heading into the playoffs. We would like to give a very special thank you to everyone who came out to the game last night. The team appreciates the support family, friends, students, teachers, and all Vikings have shown the entire year. Stay tuned for playoff information!